In November, the highest-priced sale of the month took place in Wilmington with the more than $1.7 million purchase of the home at 6808 Towles Road, according to the Just For Buyers report. Nine new listings were added to the rolls in November, four in New Hanover and five in Brunswick, according to the report. The most expensive new listing is at 6417 Quail Run Road in Wilmington, a 6,500-square-foot mansion on 4.5 acres with a heated pool, an indoor custom spa tub for 12 and deeded water access. The home’s list price is nearly $2.5 million. 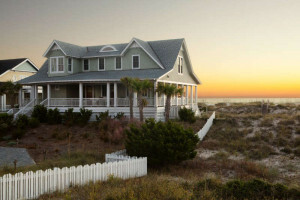 The most expensive home on the market at the time the report was compiled was 188 Beach Road South on Figure Eight Island, which has an asking price of $6.5 million. The next most expensive property is 2 Marina St. in Wrightsville Beach at $5.5 million. In addition to the house and a guest/rental apartment, the 2 Marina St. listing includes the Overbeck Marina with 17 boat slips, according to the report. The report uses numbers from the Wilmington Regional Association of Realtors’ and the Brunswick County Association of Realtors’ multiple listing services. Sourced: Excerpt from Wilmington Business Journal, December 2015.